The Penguins season has been... well... hooooo boy. Where do we start? However it's Halloween and things aren't all bad! We go trick or treating with the back-to-back Stanley Cup champs! 5. The Injury Bug- None of this is shocking. After so many years of moving in to CONSOL/PPG Paints haunted Indian burial ground the injury bug has been continual. As a result the injuries shouldn't be surprising. What may be surprising lies in the specificity. The defense has taken hit after hit and for a unit that was most depleted by free agency, that hasn't been great. 4. 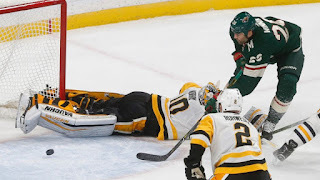 Mike Sullivan's Lack of Answers- After last game's blow out loss to the Winnipeg Jets (! ), Mike Sullivan was at a loss. He dropped the dreaded "I'm not mad, I'm just disappointed" on his team and it seemed to be a good measuring stick of where the team stands. To paraphrase Sullivan, the team says they know what's wrong, they know what to correct, they make lip service on doing so, and on ice the game plan goes out of the window. Where is the disconnect? The most important person to know doesn't seem to. 3. 5-on-5 Doesn't Jive- A team with Sidney Crosby, Evgeni Malkin, Kris Letang, and Phil Kessel shouldn't have trouble scoring goals at even strength. While it's justifiable to claim "SMALL SAMPLE SIZE" as the team adjusts to adjustments after the inevitable turn over following a season of very little, it's beginning to be troubling. They currently rank 28th of 31 in 5-on-5 scoring with 17 goals scored. That's over 13 games. 2. Anti-Niemi- The less we speak of him, the better. 1. Back Up Goalies in General- Skipping the obvious glaring issue we briefly mention above, what's the answer? Casey DeSmith was called up and had exactly 2/3 of a game to establish himself. In that time it was... not great. He was soon sent down in favor of Tristian Jarry, who hasn't been so hot in WB/S. Where does the answer lie? With so many back-to-back games remaining there needs to be some answer. They can't all be gimmies for the away team. 5. McKegg's Got Legs- Picked up from the free agency pile, an afterthought in Tampa, Florida, and Toronto, McKegg has proven to be a valuable fourth line addition with the losses of the likes of Matt Cullen and Nick Bonino. With the smarts and legs to keep up with the Penguins system, he made the transition to Pittsburgh seamlessly and has helped bolster a weak lower six. 4. Maatta Matters- The past few seasons for Olli Maatta haven't been quite right. He's seemed slow in his foot speed as well as his decision making. We'd see sparks of the guy who blossomed as a rookie into a special, and unexpected, force but injuries had seemed to slow him. Not this year. Mentally he's sharper than ever, once again becoming the offensive force we expected (2+6 in 13 games). Physically he looks as healthy as ever, with his pace improving. If this is the Maatta that we see going forward his contract is once again a steal. 3. Phil's Thrills- Nice guy, tries hard, loves the game, two time Stanley Cup champion. This year Phil Kessel has decided to add overtime hero to his resume. While the Penguins struggle 5-on-5, Phil took to heart the cries for him to shoot more. While only one 5-on-5 goal, Phil's also added a power play goal. More importantly half of his four goals have been overtime game winners, his last being his 300th career goal. His nickname has always been Phil the Thrill and it's looking like a full off season to train without injury has really helped him. 2. Power Play, Take Me Away- The Penguins can't score 5-on-5, they just can't. As puzzling as that may be they don't seem to be having too much of an issue scoring with the man advantage. Fourth in the NHL with a 28% conversion, with 14 of the team's 36 goals coming on the power play. That's almost 44% of the team's goals to date coming a man up! For a team that has always seemed to be frustrating while a man up, this is hashtag good. How long they can continue, especially as the league slides back to the median when it comes to calling every slashing penalty, is up in the air. For now, though, it'll do. 1. Money Murray- With the great indecision in the back up position with the departure of Marc-Andre Fleury to Vegas, Matt Murray has been given his thrown and has not disappointed. While not always flashy, he's done more than enough to give the Penguins a chance to win almost every game he's been a part of. While the Penguins piece together the early parts of their season this is all you can ask for and Murray has delivered in spades.